“CPQ Perspectives” is a series of blogs that is designed to look at Configure Price Quote systems through the eyes of those who encounter them. We spend so much time talking about CPQ as it relates to sales and organisations engaged in the selling of products and services that we lose sight of the fact that CPQ extends well beyond those processes. Our first piece will focus on the most important player in the selling transaction, your customer. What matters to buying customers? Initially, prospective buyers are focused on one thing: Does the seller offer anything relevant to me or the issue I’m trying to resolve? It doesn’t matter if the prospect is an acquisition specialist, procurement agent, LOB manager or someone not directly involved in the business buying process. The prospect has an issue to be resolved, and they are not interested in wasting time on irrelevant interactions. Almost any sales or marketing professional knows the critical importance of the first impression—the email subject line, the first few seconds of a telemarketing call or the impression made by the landing page your prospect encounters. These are the points at which the buyer will decide to disengage or continue interacting. As the interaction develops, the buyer will move away from the relevance question into more specific and detailed informational queries. During this phase, impressions are formed that relate to the quality and validity of the information provided, as well as any claims made by the seller. Finally, the prospect is more fully engaged, and their overall customer experience is formed and reinforced by more subjective elements like ease of navigation through your website as they seek more and more information related to their needs and your solutions. These elements drive the impressions that are formed related to transparency, deception and lack of credibility or honesty, reliability and credibility. How does CPQ impact the customer experience? If your enterprise relies on e-commerce or online retailing, CPQ can facilitate an enhanced customer experience almost from the point of initial contact. The second page (the question page) makes no pretence about being exactly what you need or having the best of anything. It asks you to describe your problem. This is how CPQ works. An interactive interview process between the buyer and CPQ obtains information from the buyer and uses that information to prompt other questions that are designed to help the buyer fully describe their needs. CPQ guides the buyer through options and selection points as more and more information is provided. This give and take of information is done in a non-threatening, no-pressure environment, assures the buyer that no assumptions are being made about their needs and that any solutions proposed or explored are based upon buyer-provided information. Properly executed, this may be an extension of a guided-selling process that tracks and evaluates a prospect’s online behavior and content preferences in order to direct and select specific calls to action and additional content offers that are likely to appeal to your online visitor. This interactive process seamlessly moves into a more direct interviewing mode within the CPQ itself. As the engagement moves forward, validity may be established and confirmed by the citation of customer stories or other collateral that offers high-value, high-credibility information. Order visualisation tools provide additional feedback to the buyer and confirmation of their selections through visualisation of the product they are configuring. All of this can be coordinated through the CPQ solution as a self-service, online, order-configuration tool. For sellers who are not employing online or e-commerce facilities, CPQ can still provide all of these benefits via the consultative sales rep who is interacting directly with the buyer. The same hierarchical interviewing process takes place. Buyer-provided answers prompt additional questions and gradually narrow the focus of the discussion to a specific potential solution. This is a customer experience during the buying phase that offers credibility and assurance of relevance to the buyer. Once the buyer is convinced and the purchase decision is underway, CPQ continues to provide value to the buyer. CPQ provides a detailed proposal related to what is being purchased. This can include bills of material and other detailed part and assembly summaries as well as specifics related to why certain selections were made. Additionally, full disclosure of accurate pricing and discounting are made available collectively and on a line-item basis. Pricing transparency is ensured with CPQ. Finally, CPQ documents any peripheral commitment made in terms of product performance, delivery or ongoing service and maintenance. The whole deal is documented, not just parts and prices. CPQ provides confidence to the buyer—confidence in the seller’s ability to help them achieve their goals, confidence that the solution selected will address their needs and confidence that the deal they have negotiated is based on demonstrable alignment of value with price. This benefit is universal to almost any buying transaction regardless of type. B2B, C2B, manufacturers, distributors, electronic components or healthcare services, the product doesn’t matter; the buyer still requires that assurance of confidence—confidence that the time they have spent engaging with you is not wasted, confidence that you can help them with their issue. 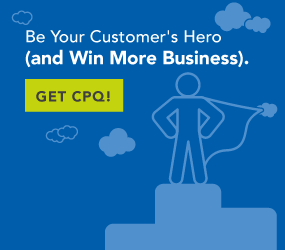 CPQ delivers confidence to your customer.